The Ethicist ponders the question: Should board members be precluded from bidding on sub-contracted work? After tough criticism of his presidential campaign from Steve Rosenfeld of AlterNet and Thomas Mann of Brookings, single-issue presidential candidate Lawrence Lessig responds. This article by Paul Hogan of the Oishei Foundation is a response to Buzz Schmidt’s “All Enterprise is Social.” Please join this conversation! No matter how well intentioned, the off-the-record, behind-closed-doors meetings of Detroit foundations with U.S. District Court Judge Gerald Rosen to protect Detroit’s city-owned art collection from being sold off as part of the strategy to pull the city out of bankruptcy carries two serious dangers that cannot be minimized. Billionaire philanthropists have many options for doling out their mega-funds, and many will opt for traditional private foundations. But how do we raise questions about the timing of long-term grantmaking? And does the “spend down” model need rebranding? 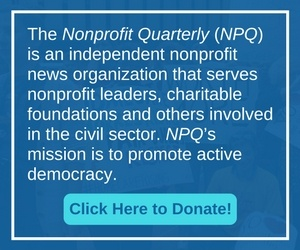 At the Nonprofit Quarterly, we take pride in being both opinionated and, in terms of elections, nonpartisan. We won’t tell you who to vote for, but we do urge you to cast your ballot tomorrow.